2 DAY PASS - Valid any time. 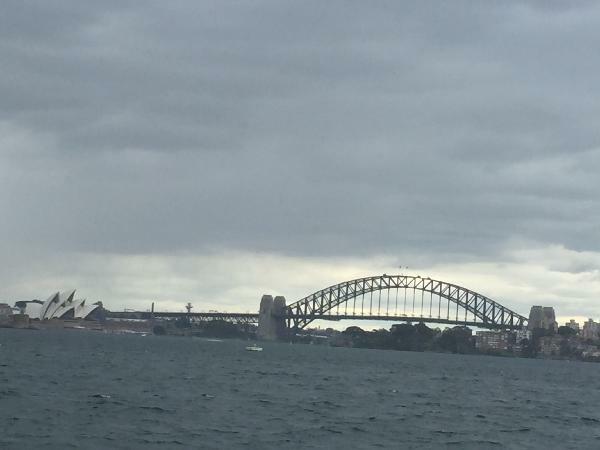 When in Sydney, travel like the locals do - On the Sydney harbour highway! This 2 Day hop on, hop off ferry pass makes navigating Sydney’s top ferry destinations easy and with up to 11 stops to choose from, this flexible pass will help you to explore the very best of what Sydney has on offer. Passengers can also enjoy live guided commentary onboard our comfortable catamaran and with regular departures from the various stops you won’t have to wait long before setting off on your next adventure. Departures: From Circular Quay Wharf 6, Darling Harbour Pier 26 or from Manly East Wharf. Please note that the timetable below is indicative only. Departures range between 9.15am and 6.40pm. A daily timetable will be issued with your boarding passes. Your ticket can be redeemed for any trip times within the 2 days. Useful and very organize and worth it to spend on 2 days ticket. We went to Bondi beach by train and come back by ferry hop on and hop off to the city which is really good experience for us and we rexemond to all the people to get in this ferry have a nice time. With limited time on my first visit to Sydney I did the HOHO ferry on the 1st day and the route and commentary was great. 2nd day I did the HOHO bus. Great all round. It was nice experience with enough time to go through different places and with crew explained the history of the points. For those who are looking to take a perpetual cruise on the Sydney harbour and enjoy the views, this activity for you. For those who are looking to visit several sites on the Sydney harbour, this is also for you! While I wasn't able to visit Watson's Bay or Manly, I did get to visit Shark Island which gives you a secluded island with unbeatable views of the city. The timetables do get a bit confusing and Capt. Cook operate several other cruises with similar boats so sometimes that can throw you off. Also they also have special timetables in effect for a particular day that can usually decrease service so keep that in mind, especially since you won't know ahead of time. Great way to see the harbor and you even commentary through it, I fully recommend getting these tickets, you can hop on any boat go somewhere hop off go for a stroll and come back and hop on the next boat. Your message has been sent to Sydney Harbour - 2 Day Explorer Cruise - Hop On Hop Off Rocket Ferry Pass. You should hear from them shortly. Please note: all responses will come directly from Sydney Harbour - 2 Day Explorer Cruise - Hop On Hop Off Rocket Ferry Pass, and not the team at Bookme.